In theory being in business is super simple. You create something to sell. Then you get it in front of people so they can buy. Like most things…sooooo simple… but not all that easy. If it was – we’d all be kajillionaires by now. 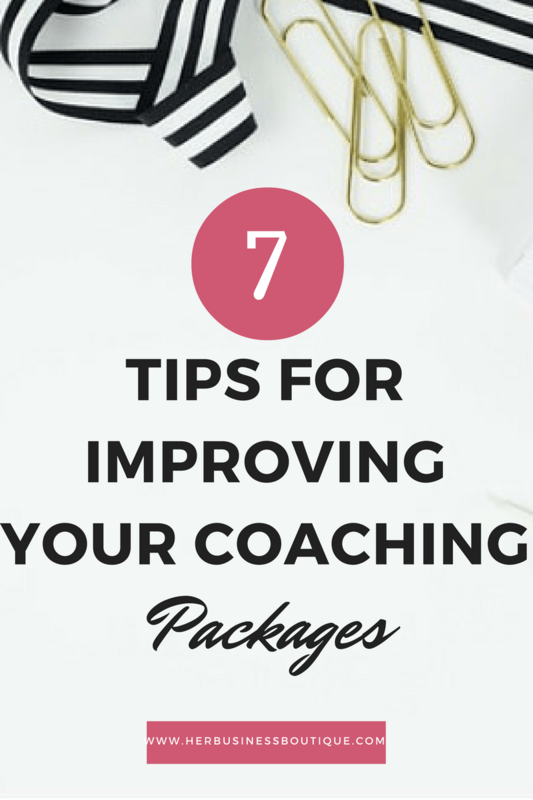 Here are 7 ways to improve your coaching package so they sell like caraazy! Coaching is all about your ability to create a space for transformation for your client. And people invest in getting results. You’re not responsible for their success but you do want to keep the focus on what their most desired outcome is. When designing your coaching package you need to make it all about them! Here’s how to do just that. First ask yourself, if your client could only walk away with one thing at the end of your time together, what would make them happiest? Write that down because it’s the core of your package. Then you need to imagine your potential client goes all in, 100% and implements everything you suggest as their coach, healer or consultant…what kind of results would they get? Write that down too and use it as the central selling point of your package. This is great way to position your offer and give yourself a confidence boost as a coach or service provider too. What are the top 5 benefits someone will get from completing your program? These can be immediate benefits or lifetime benefits. Write those down and add them to the copy of your sales page, email or consult script. Leading with the benefits of what’s possible for your clients is what gets them excited about the possibility of changing their current situation. Depending on what you are delivering you want to give your work a container by deciding how long it would take someone to get the results you mapped out in step number one. When you offer random series of sessions with no end in sight that people can use as needed, it really takes the focus out of the transformative element of the work you’re doing. When you have a specific time frame – like 6 months or 90 days – to hit a specific goal, both you and your client are on the same page and going at the same dedicated pace. Remember a few weeks ago when I talked about how to write content for your target clients? And how the way you solve someone’s problem is going to be unique and different than how I would solve their problem? Your signature method has your name stamped on it. It’s a blend of your modalities, experience and training of what you find works best in getting your clients major results. Now you can name your signature method to give yourself some boosted branded credibility. Kinda how Tracy Anderson has The Tracy Anderson Method. Just by adding method at the end of her name she actually branded her whole approach to health and fitness. Equally important is naming your program something clear and appealing. Does your name clearly tell your potential client what they get as being a part of your program? If not, go back to tip #1 and see if you can include it in the naming of your program. I’m shocked at how few of ya’all DON’T have your Paypal buttons ready to go. If you don’t have a way for people to pay you, energetically and practically speaking you are NOT expecting to make any money in your business. You build it (and market the heck out of it) and yes, they will come. So make your Paypal buttons for your offer and make sure to include the different variations if you offer payment plans or fast action saving bonuses for clients. Save them in a file or embed them onto your website. When your done with that, draft the welcome email you’ll send to new clients and keep it in a folder so you are ready to accept people into your program with ease and total order. Again this is so you are all prepped and ready to welcome new clients into your world. You’re expecting to book new clients, right? I have each of my clients set a goal at the top of the month for the amount of people they want to work with and pin it to their wall. They fill in the names as the clients show up. It’s super magical! So if your intention is to book 4 clients this month, you must have the initial email, questionnaire or any other miscellaneous welcome materials they would receive as soon as they hit the buy button. There are a lot of super cool things you can add in to your package that will tip people from hmmmm maybe to oh yeahhh I want it. What can you add that would surprise and delight your dream client? Tickets to a live event, access to one of your digital trainings, books, delivery services or any other perks you can think of. Brainstorm of list of 10 ideas and circle your top 3. Bonuses can be a static part of your package or something you add in and take away for special promotion periods (this works really well to create a sense of urgency and gets people to take action now). I’ve been offering a chance to have my team implement the tech piece of growing your business online the past 2 weeks and it’s been a great bonus incentive for people who’d been thinking of working with me. Ok there you have it! You have to loooove your package. If you don’t…go back to the drawing board. Once you’ve got something amazing to sell. The next part is all about getting it out there. If you want to chat about how I can help you do both, go here to schedule a no pressure consult about possibly working together. My special bonus expires this month so now is always a good time!